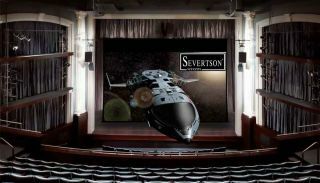 The What: Severtson Screens will feature the SēVision 3D GX Giant Electric Motorized Cinema-Sized Projection Screen line during InfoComm 2018 in Booth C3638. The screens are available up to 12 meters wide and are ideal for large venues where the screen needs to be raised and lowered, like in an opera or play house with a large stage environment. The What Else: The giant electric motorized projection screens are available in all offered gain levels as well as in non-perf, cinema (standard) perf, and microperf so the soundstage can be placed behind the screen similar to premier movie theatrers. The Bottom Line: The new SēVision 3D GX Giant Electric Motorized Cinema Projection Screen line features a coated surface to reduce bruising and scuffing; viewing angles ranging from 30- to 40-degree half gain, depending on the specific screen gain requested; and water-based coating to promote longevity by maintaining optical properties over time.